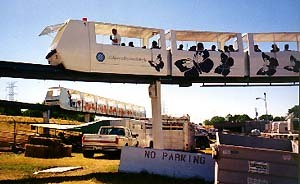 Since 1969, the six Universal Mobility Inc. monorail trains at the California State Fair and Exposition have worn more paint jobs than the extinct Luxor-Excalibur monorail in Las Vegas had passengers. The current incarnation of this Sacramento system's paint scheme is so original that I hope it stays. 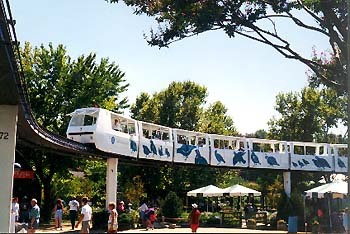 The four remaining trains are named "California Dog-Faced Butterfly," "California Valley Quail," "California Poppy" and "California Golden Trout." 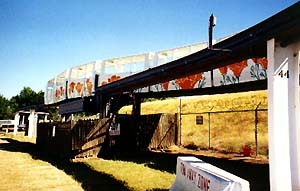 The white trains are emblazoned with each train's namesake along its entire length with the Cal Expo logo on each side. Editor note 2012: The mid-way station was closed due to the gaps between the train and platform in the curve. Gaps are too large for safe boarding and unboarding. Dog-Faced Butterfly passes waiting California Poppy train on storage spur.